My home is rather spartan; my decor likewise. 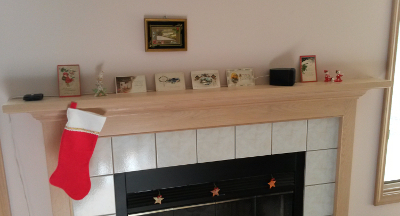 Here is my mantle. You can see some figurines, a stocking, and some Christmas postcards. The postcards are real and actually mailed, but are not from my own family history. I bought them in an antique shop. They are evocative. The newest is dated 1925; the oldest 1913. 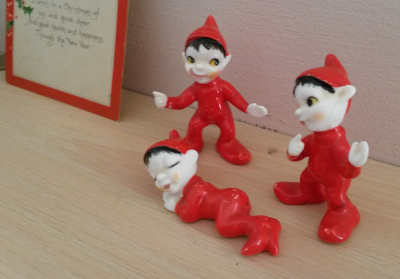 These figurines are antique, too, and also from the 1960s, but are from my family. Here is my tree. A proper bachelor's tree; a gift from my mother. I've had to restring the lights once. The original lights died. The angel at the top I inherited after my dad died and my mother faded. 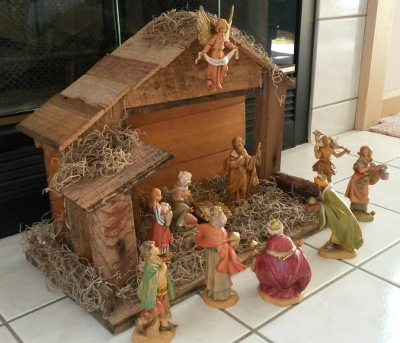 My mother bought it for their first Christmas as man and wife, in 1962. It cost $1.25. That was apparently a lot in 1962, especially since my parents, middle class or not, were poor at the time. 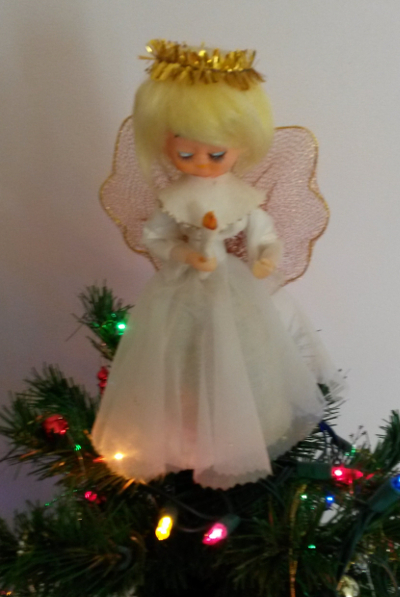 This angel was at the top of every one of my family's Christmas trees. Here it is in 2017. It is truly an article of family history. * Later it seemed to me that the figurine might be a tad older than the 1960s. The polka-dot outfit, the feet that aren't feet, and just the general look more evoked the 1950s. Well, I inspected it, and saw that its bottom was marked JAPAN. So it was made in Japan. Now, from my slight forays into the antique world, I knew that during the occupation of Japan by America after WWII, exports had to be marked OCCUPIED JAPAN. I knew that the Occupation ended in the early 1950s — 1952, as I recently confirmed. So this figurine, which lacks the mandated OCCUPIED, is at least post-1952, and the 1950s saw a lot of figurines exported from Japan. 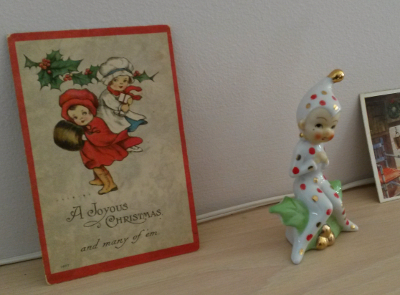 So, "late 1950s" might be the better guess for this pretty little elf. You know: back before everything got ugly.